“We are part of the electromagnetic and sonorous vibrations of the Universe in which we are absorbed"
• Egyptians attributed to the Goddess Iside, who ruled the emotions and the soul purification, the creation of melodies. • The ancient Chinese civilization (III sec. a. C.) connected the five elements with their respective sounds. 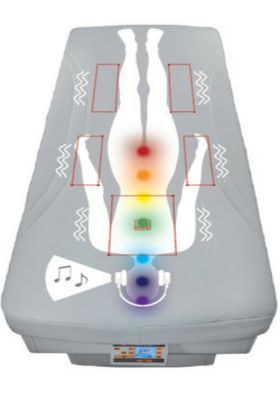 • In India, from the ancient times, the 'doctrine of sounds’ was studied and tested and it’s still practiced in some places: the base there is the idea of a close relationship between man’s health and its connection to the Universe, that can be reestablished with the right sonorous vibration. Back to our days… We all naturally and instinctively know endless ways to use music to get positive effects! We do that choosing a certain music to wake up, as a companion for a trip, in the evening to relax or to recall an important personal moment alone or with somebody. Seemly when we go to the concert of our favorite performer. Then there is the music we sing, whistle or simply a lullaby to let our baby sleep. There are so many ways to do and listen to music or to stay silent, because also the silence is a form of music, difficult to experience in our frenetic and loud contemporary era. For what concerns the word ‘music therapy’, it comes from the Greek 'musiké', which means a man in word, sound and movement and 'therapeia', meaning assistance, treatment and recovery. Music therapy and language: one of the best methods to apply in this field is the Electronic Ear created by dr. Alfred Tomatis. It’s based on the listening, with dedicated headphones, of selected tracks with high frequencies (usually Mozart or Gregorian chants) which stimulate and give energy to the nervous system. Tomatis studies were focused on communication and language disorders, especially on children autism, but people of any age can get benefits such as relaxation, physical and psychological wellness, communication and sing improvement. Some famous artists obtained benefits from the Tomatis’ method, such as Gerard Depardieu, Maria Callas and Sting. Music therapy and old people: Alzheimer and Dementia. In 2001 the American Academy of Neurology indicated the music therapy as a technique to improve the functional activities and reduce the problem of behavior in case of Dementia and Alzheimer. This is possible because music seems to be a ‘privileged road’ to enter the patients’‘heart’ , which preserve some abilities and musical competences intact (intonation, rhythm, tonality). During the sessions the patients sing popular songs, dance or listen live music, always with attention that they don’t feel uneasiness or to request them abilities over their capacities. The main objectives are: to improve socialization, to contain aggressiveness, to increase self-confidence, to encourage or maintain memory and motor skills. Music therapy and stress: a study made by dr. Barry Bittman, Director of Mind-Body Wellness Center in Meadville, published in 2005, shows for the first time that the musical experience can reverse more components involved in the human stress reaction, at the genome level. This theory opens new horizon to stop pharmacologist intervention and ‘sensitize’ to oppose to one of the worse plagues of the contemporary age. The daily life commitments often impose fast rhythms, our mind is constantly stimulated by input, if to this physical and emotion ‘burden’ we can’t alternate moments of psychological and physical relaxation, we could incur some problems such as digestion disorders, headaches, respiratory difficulties or insomnia, all signals of stress. One of the most useful tools which can help to lower the stress level is passively listening to music, singing or playing an instrument. The music can relax muscles, regularize the breath and the heartbeat, relax the mind… Not only for adults, music is used inside childcare facilities as a good help to lower children’s tensions and stress due to the separation, also if temporary, from their parents and to help them sleeping. All these actions are possible thanks to the music physiological effect to decrease the level of cortisol (an hormone related to stress) and to free endorphins that have relaxing and analgesic effects. Music therapy and pain: the music has an analgesic effect. It has been demonstrated by the Javeriana University School of Medicine in Bogotá, the department of anesthesia ofTufs-New England Medical Center in a study publishedon a magazine in the Cochrane Library. It’s believed that notes create relaxation, reduce anxiety, distract the patient, decreasing the physical pain and consequently could become a good allied of the post-operating departments. The music stimulates many brain areas such as auditory, motor and limbic associated to emotions, it influences the heartbeats, the blood pressure, the breathing (it increases the available oxygen) the level of some hormones as cortisol and endorphins. This can clarify because it is so effective in the management of the pain. It helps to reduce both the feeling and the anguish of the post-operating chronic pain. Listening to music can reduce the chronic pains of different pathologies for example osteoarthritis and fibromyalgia (on which there has been done a specific study in Spain). This is the reason why music is present, even if not enough, in hospitals: music can reduce the assumption of drugs during the birth, the post-operation pain and it integrates the use of anesthesia during surgeries. Music is used in dying cancer patients (Hilliard RE, 2003) for the pain control and helps the physical wellness and relaxation, probably thanks to the higher release of endorphins due to the listening. Music therapy and pregnancy: this topic deserves a special paragraph! The uterus is a ‘sonorous place’ in which thefetusacquires the ability to ear, interact and answer. The fetus feels for the first time through the touch then, after the 6th month also through the hearing: it feels the internal sound of its mother’s body and also the external environment. Among all noises, the maternal heartbeat emerges and covers the others. The maternal voice is either inside and outside but cannot be heard clearly. The fetus doesn’t recognize the single words but the 'music' of the language with which it establishes a first contact with its parents. It’s very important that both the mother and the father speak and sing to the baby, creating a first family bond and a feeling of trust in life. In some countries, during pregnancy, singing the birth it’s an habit, manifested in different ways. This practice is an help both for the fetus to recognize its mother’s voice and get a sense of serenity, and for the mother herself who, using the song filled with energy, gets further tensions and anxiety. As it regards the choice of music, M. Clements’ studies revealed that Brahms and Beethoven upset, Vivaldi and Mozart calm down and rock music trig the fetus. Speaking about the importance of the fetal sound experience, a study done by D. J. Shether showed that children between two and five years, exposed to the prenatal musical stimulation, are able to give organized speeches, memorize and remember longest songs. As last example, I quote the use of audioanalgesia in obstetrics, listening to music between the contractions reveals a higher and better control of pain during the labor. After this writing about music influence on our body and emotions, the importance of the choice of the music becomes clear. 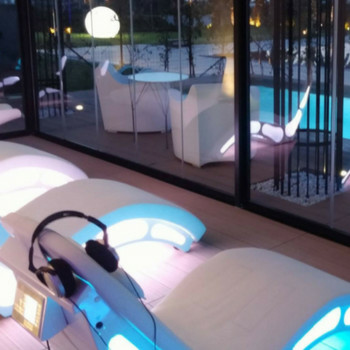 If we talk about a Wellness Center where the primary objective is to provide a moment of total psychophysical relax for the customer, the choice of the music is an essential aspect, in addition to the environment, because it determines, in a meaningful way, the customer’s needs. People who work in the wellness sector must know how to chose the tracks for each environment: some types of music are better for the reception space, others for the massage cabins and, to be more specific, for each type of massage there should be a different track. If we talk about relaxing massages the right choice is pure music, without words, where you listen to the sounds of nature, especially water. 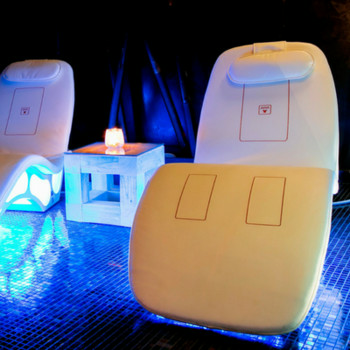 It is recommended, at the end of each treatment, to leave the customer for few minutes in a relaxed position with a background music, able to bring him to reality slowly, extending the effects of the treatment which will be more durable and will remain in his memories as a pleasant experience. Last advice: if we want to let the customer live a complete and pleasant sensorial experience it is also essential, besides the music, to choose the better color and aroma to spread in the room, all in total harmony. An example: for a relaxing massage we generally choose a slow and winding melody with a combination of calming, essential oil, as lavender or Melissa, together with a green or blue as color to enlighten the room. If we finally offer a ‘theme’ tea, we have a complete positive effect for all the five senses! ISO Benessere with the Vivaldi bed and the chaise longue Note mix together the benefits of music and vibroacoustic allowing the client to reach a full psychophysical relax. The music is an essential element for ISO Benessere and lots of our types of equipment has music as an included characteristic. Come to discover our products!